This pattern is made in sections, and then joined together. Using F/5 (3.75 mm) hook and Color I, ch 30. Row 4: Turn, *ch 3, sl st to next stitch, ch 2, sc in same stitch, repeat from * to end. Row 5: Turn, working on Row 2’s exposed loops, *ch 3, sl st to next stitch, ch 2, sc in same stitch, repeat from * to end. Row 6: Turn, working in Row 1’s stitches, *ch 3, sl st to next stitch, ch 2, sc in same stitch, repeat from * to end. 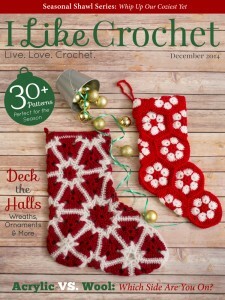 Twist the strip semi-tight and join ends with yarn needle to create the wreath. Using 1.5 mm and Color J, ch 15. 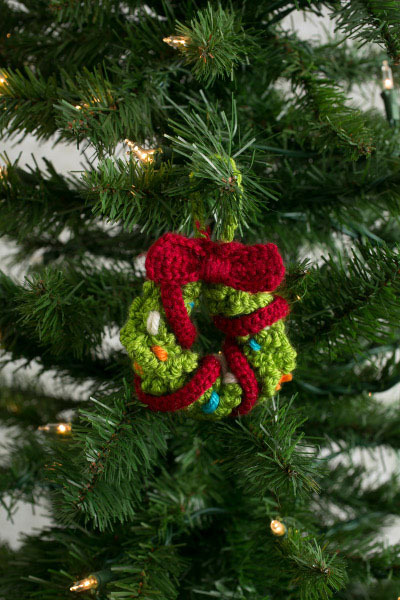 Wrap the middle 15-20 times, secure and then sew onto wreath with yarn needle. Using 1.5 mm and Color J, ch 110. Wrap streamer in and out of wreath loosely. Secure ends. 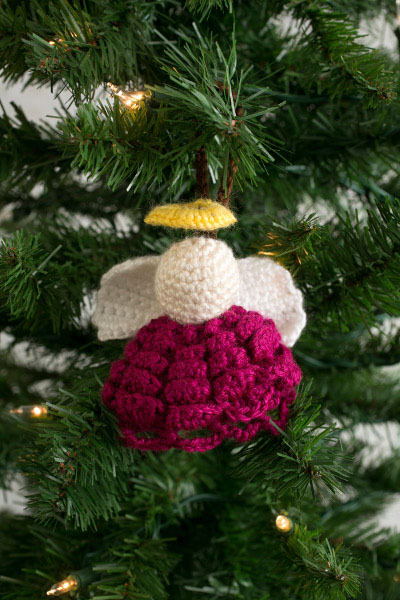 Using yarn needle and scrap yarn, embellish wreath by stitching in “lights.” Fasten off. Weave in ends. This pattern is made in a panel, sewn together and then embellished. Using Color J, ch 31. Rows 9-30: Turn, sc dec, sc in each stitch to end of row. Note: Each row will decrease by one stitch count. 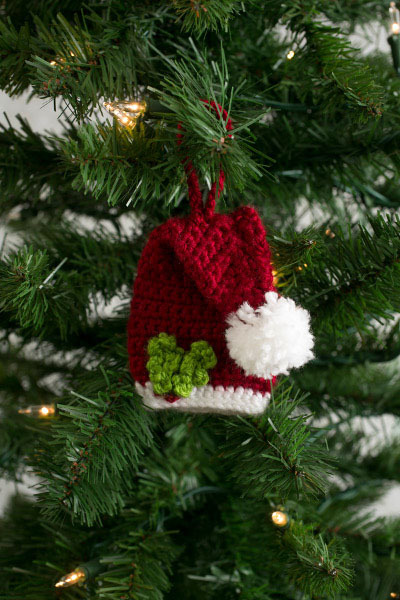 Using yarn needle, sew the hat together. Turn right side out, pull the top of hat to the side, pin down with the yarn needle and yarn. Add a mini pom on end of hat. Join Color A at seam. Rnd 1: Ch 2, dc same stitch and in each stitch, sl st to first dc to join. Rnd 2: Ch 1, sl st in each stitch, sl st to ch 1 to join. Using Color I, ch 6. Row 1: Sl st in first chain from hook, ch 2, sl st in same stitch, sl st in next stitch, sl st in next chain, ch 2, sl st in same chain, sl st in next chain, (sl st, ch 2, sl st) 2 times in last chain, working on opposite side of chain sl st to next chain, (sl st, ch 2, sl st) in next chain, sl st in last chain. Using yarn needle, sew onto hat. Using yarn needle and Color J, sew on ‘berries’ under the leaves’. The ornament is made top down. The dress can be left dainty and open or embellished with ruffles as shown. Using Color B, ch 2. Rnd 11: Ch 2, dc in same stitch, * ch 2, skip one stitch, dc in next stitch, repeat from * until 2 stitches remain, ch 2, skip 2 stitches, sl st to first dc (not ch 2) to join. Rnd 12: Ch 3, dc in same stitch, ch 3, * skip 3 stitches, dc in next dc stitch, ch 3, repeat from * to end, sl st to first stitch to join. Rnds 13: Ch 2, dc in same stitch, ch 4, * skip 3 stitches, dc in next dc stitch, ch 4, repeat from * to end, sl st to first stitch to join. Rnds 14-15: Ch 2, dc in same stitch, ch 4, * skip 4 stitches, dc in next dc stitch, ch 4, repeat from * to end, sl st to first stitch to join. Rnd 16: Ch 2, dc in same stitch, ch 6, * skip 4 stitches, dc in next dc stitch, ch 6, repeat from * to end, sl st to first stitch to join. Rnd 1: Join yarn in first dc of Round 11, working on top of the rounds as an embellishment, in every skipped stitch (sl st, dc, sl st), do not join. Rnd 2: Using the ch 3 directly below on Round 12 (sl st, 3 dc, sl st) in that chain and in each chain space for that round. By using the ch 3 directly below, it allows the round to be worked continuously and not joined. Rnds 3-5: Using the ch 4 directly below on next round (sl st, 4 dc, sl st) in that chain and in each chain space for that round. Fasten off. Weave in ends. Using yarn needle, sew the wings together and then onto the back of the angel at the neckline. Fasten off. Weave in ends. Using the pipe cleaner, form a halo with 2 inches on each end to go into the angel to make it appear ‘floating’. Using Color M, ch 1, sl st over the halo, sc around the halo until full, sl st to first stitch to join. Insert pipe cleaner into the back of the ‘head’ and fold ends like a brad on the inside to secure. Fill the ‘head’ with fiberfill. Join Yarn at base of pipe cleaner, ch 26, sl st to base. Fasten off. Weave in ends. 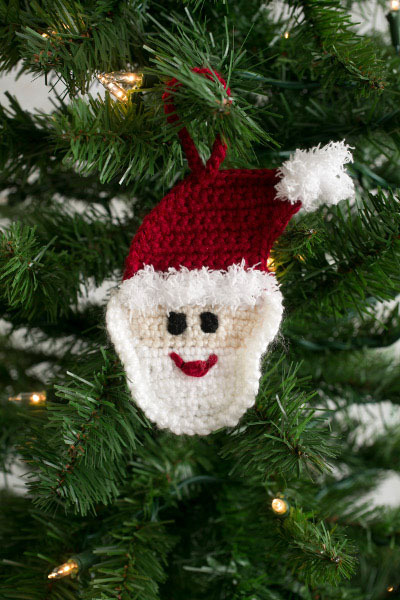 This ornament is made in sections: face, hat and then the beard is added on bottom. Using Color A, ch 10. Lay right side up and join Color J at right edge of the hat section. Using the ends of rows as stitches, ch 1, sc in each stitch around the hat. Fasten off. Weave in ends. Lay right side up with face at the top, not hat. Join Color A at right edge. Lay right side up, join Color A at bottom of hat on left side, using the ends of rows as stitches, ch1, sc in each stitch around the beard. Fasten off. Weave in ends. Join Color A at beginning stitch of last row, ch 2, sl st to same stitch, *sl st to next stitch, ch 2, sl st to came stitch, repeat from * to complete row. Fasten off. Weave in ends. Using yarn needle, embellish face, weave in Color O to add detail to hat brim and pom. 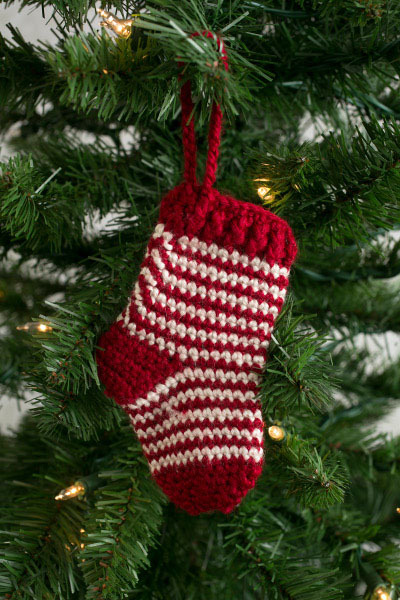 The stocking is made in one piece from cuff to toe. Using Color Color J, ch 27. Rnd 4: Join Color B, drop Color J (drop yarn and carry throughout), ch 1, sc in each stitch, sl st to ch 1 to join. Rnd 5: Pick up Color J, drop Color B, ch 1, sc in each stitch, sl st to ch1 to join. Rnd 6: Pick up Color B, drop Color J, ch 1, sc in each stitch, sl st to ch1 to join. Rnds 7-14: Repeat Rounds 5-6. Rnd 15: Fasten off Color B, pick up Color J 6 stitches to the right of the joining stitch. Ch 1, sc 13. Note: By joining 6 stitches to the right, it will allow the seam to remain in the center throughout. 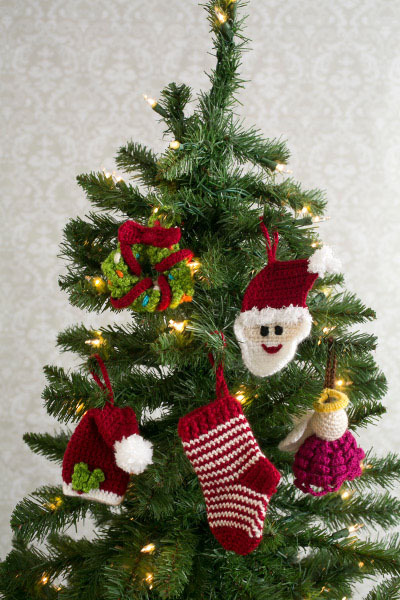 If you are making the stocking solid, you do not need to move the beginning stitches, just start at current stitch. Rnds 16-20: Turn, ch 1, sc 13. Rnds 25-32: Repeat Rounds 23 and 24. Fasten off Color B. Using yarn needle, sew end of toe together. To finish, use yarn needle and sew the heel together.